The kids woke up, unassisted, an hour earlier than usual this morning. 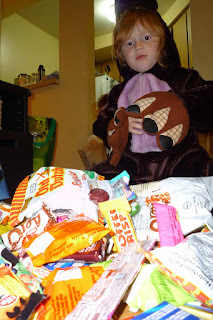 They spent most of their extra time exploring, organizing, grouping, trading candy; and changing their minds as to which goody they were going to take to school for snack time today. Kind of cute. It brought back memories of doing similar things with my sister some number of lifetimes ago. It is a bit strange, but I realised last night that we'd never actually gone trick-or-treating in our own neighborhood before. We always seem to have ended up in someone else's neighborhood, due to visiting some friend or other. But this year we just went down our own street... it's actually kind of nice (I thought) to take your kids around to meet your own neighbors (in spectral form, or besplattered with blood, as they may be). Emeth, as usual, slayed us with his "good sense". After going down the street he observed, "It's getting dark. Time to go get ready for bed." Not further along he also declared that he had enough candy, and just wanted to go home. Istra took a bit longer to satisfy, but even she, after not much more than going around our block, declared she had enough, and we could go home. Is this normal?!! 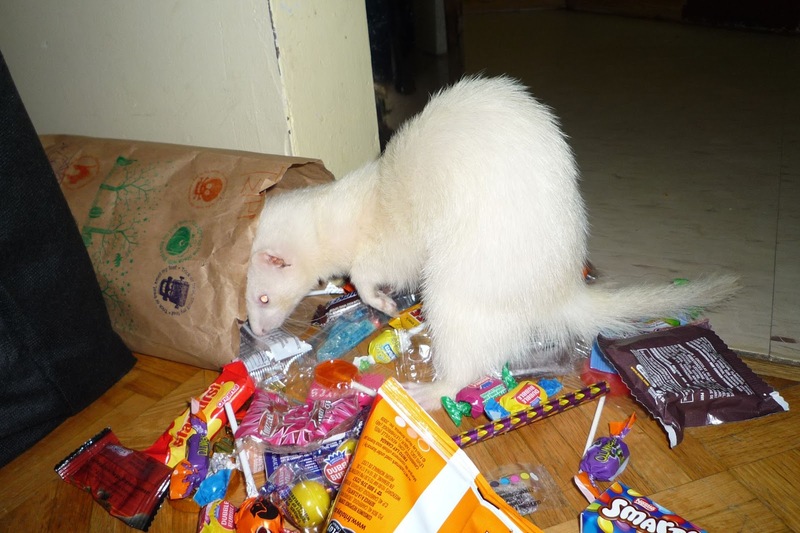 Ferrets! Thieves! Sound the alarm!